Detroit Bankruptcy: America’s Leading Indicator? Even with strong hints of financial trouble ahead, Detroit’s elected officials are still missing in action, refusing to confront the fiscal malpractice that is destroying the city’s financial integrity. Once known globally as the “Arsenal of Democracy” and motor capital of the world, Detroit was rightly famous for creative engineering, artistry and manufacturing productivity. Sadly, it now faces an imminent loss of political independence and financial governance. Yet the current crisis and efforts to solve it may very well foreshadow durable resolutions transferable to thousands of communities across the country. Detroit’s unhappy state is neither surprising nor unique among municipalities, school districts, states or the federal government. For Detroit, however, there is no more wiggle room. Liabilities exceed liquid assets, and annual budget deficits accumulate into long-term debt and unfunded liabilities that are daunting compared to projected revenues. They defy even the capacity of this economically challenged state and nation to provide loans or loan guarantees. Eighteen months ago, Mayor Dave Bing faced an annual budget deficit of $232 million, a hole equal to 14 percent of city spending. In light of past performance, Detroit’s financial condition will not improve if left to its own devices. The city ranks fourth in the nation in home foreclosures, further aggravating the decline in property tax collections. Revenue from property taxes, now at $133 million, was $185 million as recently as 2006, a 28 percent decline in just five years. More residents are walking away from their mortgages, leaving average home sales prices at $12,439, compared to $97,848 in 2003. Property taxes now constitute just 14 percent of the city’s general fund revenues. In contrast, even struggling communities like Pontiac and Taylor garner nearly 60 percent of their revenue from property taxes, according to McKinsey & Company consultants. Another fiscally stressing prospect is the bleed-out of city income tax receipts. These plunged 50 percent in a single decade, from $400 million in 2000 to $200 million last year. Yet Detroit already has the highest income and property tax rates in the state. This makes Mayor Bing’s recent advocacy of higher business taxes a sign of futile desperation, because so many former residents have already voted with their feet and gone elsewhere. Over the past 60 years, Detroit has lost an average of 19,000 inhabitants annually, taking the city’s population down from 1.85 million in 1950 to 713,000 in the 2010. Likewise, subsidies and stimulus funding from Lansing and Washington are now exhausted. Realistically, Detroit’s financial future has narrowed to two possible courses: a Chapter 9 federal bankruptcy filing, or the appointment by Gov. Rick Snyder of an emergency manager. Naturally, the city council and mayor want to keep the reins of power and decision-making in local hands. They prefer an alternative called a “consent decree.” This would let Detroit’s elected officials attempt to reduce unaffordable union pension and health insurance contracts of both current employees and the far more numerous retirees. The probability of lasting success in restructuring these contracts by consent decree appears miniscule. After all, despite myriad indications of impending fiscal disaster, major municipal unions have shown no willingness to relieve taxpayers of burdens associated with Detroit’s staggering legacy costs. Under these circumstances, and lacking hard evidence of fiscal improvement, Gov. Snyder may have no choice but to appoint an emergency manager. The efficacy of this option has already been amply demonstrated in Benton Harbor and Pontiac (smaller cities that nevertheless have similar demographics), and in the Detroit Public Schools. In the case of Benton Harbor, EM Joseph Harris, a former Detroit auditor general, converted a chronic deficit into a profound surplus in two short years. Louis Schimmel, Pontiac’s emergency manager, is turning around that city’s troubled finances, the way he fought and won a similar fiscal battle in Ecorse decades earlier. Roy Roberts and Robert Bobb, who have both served as emergency managers in DPS, have made similar progress with that imploding system. The secret to recent success for emergency managers is largely due to their new ability under last year’s reform to abrogate contracts and shed redundant jobs and operations, known as a “clean rinse.” In Benton Harbor, for example, Harris was able to limit dysfunctional city commissions to harmless functions such as opening and closing meetings. In retaliation for authorizing these expanded emergency manager powers, unions have organized a statewide referendum to abolish the new law. If they can gather 161,000 valid petition signatures, this will freeze further emergency manager work until November’s statewide general election. Reportedly they are close. If the unions get the signatures but state voters reject their position in November, then emergency manager work will proceed. However, if the unions win, Gov. Snyder will have to decide whether to toss Detroit into federal bankruptcy court. The irony, of course, is that Chapter 9 bankruptcy is considered by many to be “emergency manager on steroids.” In full-fledged bankruptcy, the city’s lenders get a “haircut,” fire and police personnel revert to ordinary “at will” employee status like non-unionized office workers, and retiree health care and pension payments can vaporize. There would be other side effects to bankruptcy. Several years ago, when DPS and other metro communities were already struggling, the mere mention of a potential Detroit bankruptcy filing caused an upheaval in borrowing costs and credit agency evaluations. Borrowing rates for Detroit Public Schools rose to 9 percent (a tax-exempt rate, no less). Even excellent credit risks like Oakland County were tainted with negative outlooks, based more on uncertainty related to spillover from Michigan’s largest city than the flailing "Big Three" automakers. Ironically, years of failing to heed the many hints of stormy finances may prove redemptive. 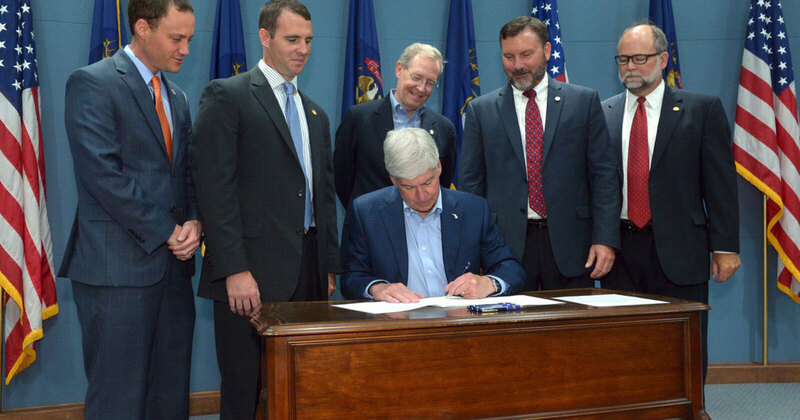 That’s because of the expertise of Michigan’s current emergency managers, who are experienced and laser-focused. Partnering with a resolute governor and Legislature, and empowered by a strengthened emergency manager law that places public interests above special interests, a troubled city’s financial future is certain to be stronger. This raises the real possibility that Detroit and Michigan may once again become positive leading indicators, offering tangible proof that a bolder, more confident America can overcome the economic and financial troubles ahead. David L. Littmann is senior economist at the Mackinac Center for Public Policy, a research and educational institute headquartered in Midland, Mich. Permission to reprint in whole or in part is hereby granted, provided that the author and the Center are properly cited.